Celebrate with families, friends and alumni of the CSUN Child and Family Studies Center. 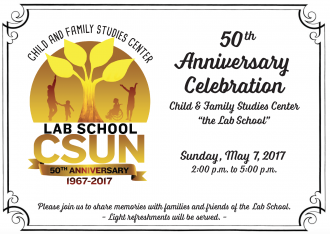 The Center, also known as "the Lab School" celebrates 50 years of service to the community with a patio reception on Sunday, May 7. This event is open to the community. Please join us for memories with families and friends of the Lab School. Light refreshments will be served. The Center is a thriving educational home for pre-school children, parents, teachers and school administrators. Early on, the Center established several models for curriculum development which have generated positive ripple effects that impact families, communities, and the early childhood education profession. This anniversary event is an important milestone. Over the past fifty years, countless lives have been positively affected by the principles and curriculum of the Center. As the preschool children have grown up, and as the CSUN students have become teachers, they all take the Center with them. And, of course, this is a reunion, too. We’re excited to see some of our preschool alums all grown up and look forward to seeing our former CSUN students now established in their careers. All are welcome to this family event. A silent auction will raise funds and lucky winners may find themselves in places such as Universal Studios, the Pasadena Playhouse or an LA Rams Game or any US destination on Southwest Airlines. Light refreshments will be served. To purchase a ticket, ($30 adults, $10 children under 18) visit the event website. Proceeds support the Center. The Center is affiliated with the Department of Family & Consumer Sciences (FCS), within the College of Health and Human Development. As an instructional unit, our primary mission is to instruct and train university students to work effectively with young children and their families. We are committed to fostering the continued growth and development of the "whole child" - cognitively, socially, emotionally, physically, and creatively. An active learning approach, based upon developmentally appropriate inclusive practice, encourages self-exploration and discovery through interactions with peers, adults, and materials in the environment. Through the formation of partnerships with families, and the provision of a safe, nurturing environment, the Child and Family Studies Center acknowledges the needs of the individual child and the values of the family.